April 20th, 2014 by KTU | Filed under Karl's cooking hacks, Notes on Approaches. As far as I can tell, the only real downside is that you can not season the meat in the bag before cooking. However for a thick cut, that seasoning is never going to make it far into the meat anyway. So, you are going to want to use a sauce to impart flavor. Here is the lamb adventure (so easy). 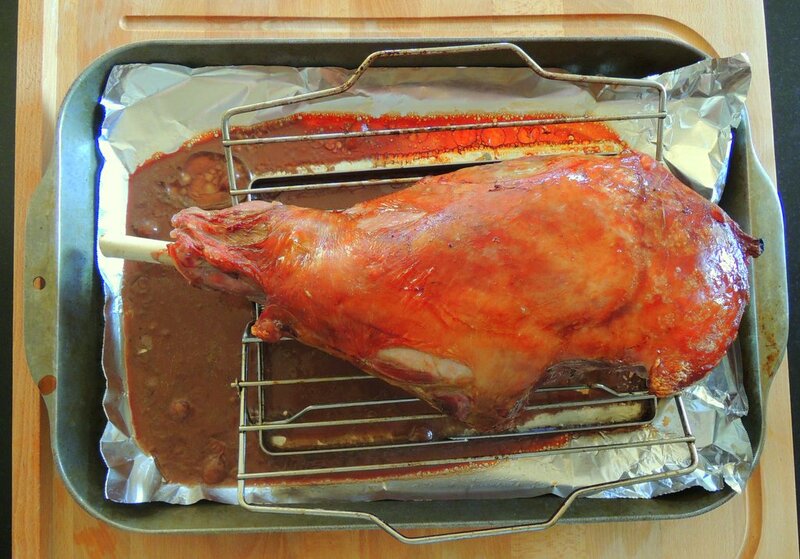 Buy a leg of lamb that is vacuum sealed. Mine was a 6 lb. Australian leg bought from the grocery store (the New Zealand and Australian products are a little smaller and a little less expensive than the U.S. products). Leg of lamb in sous vide bath in as-is LDPE vacuum package. Cook it sous vide for at least 11 hours at a temperature of 140F. You’re going to need longer for a bigger piece of meat. It takes 10-12 hours for a roast this size to reach the target temperature sous vide. I found the 140F perfect. I can imagine some people wanting it slightly more pink, maybe 136F. I don’t think you should go lower however — the fat doesn’t really melt very nicely. I was really happy at 140F. 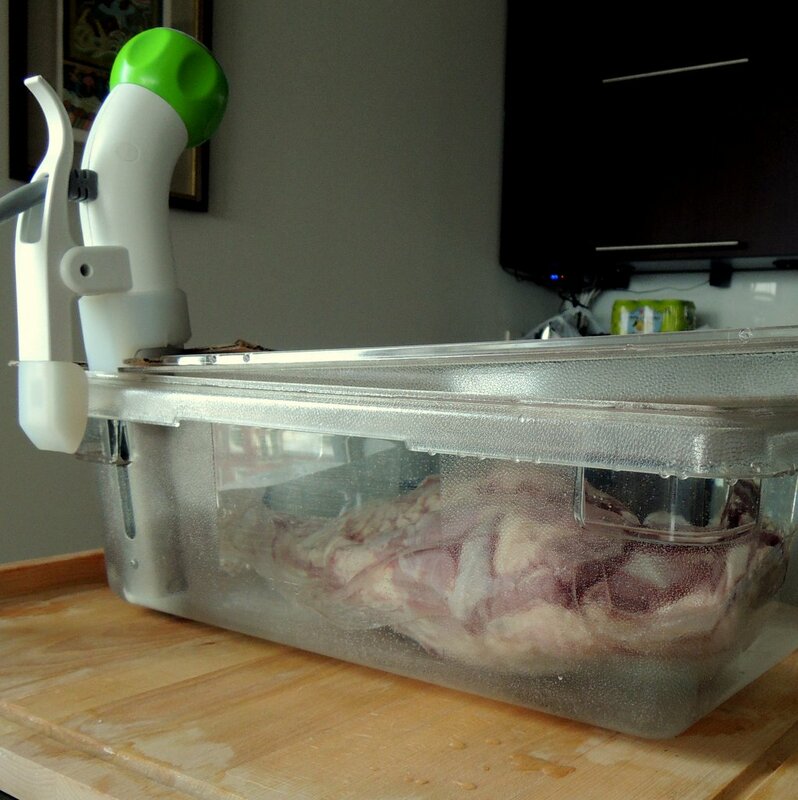 Take it out of the sous vide bag and put it on a rack in a roasting pan. I like to put foil under it to make the clean-up easier. Crank your oven up all the way (mine goes to 500F plus). Dry the roast with paper towels. Pop it in the oven for 10 minutes or until your smoke alarm goes off. This is to give you a perfect golden skin. 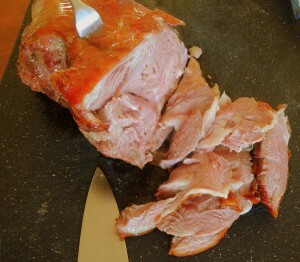 Then, let it rest 10 minutes, carve, and eat. This was a little more pink than is evident from the photo. It was really perfect. The lamb was a perfect medium-rare+ pink at 140F. My family really enjoyed it with the Bandar sauces (created by a couple of my Wharton innovation students) — the Mint Cilantro worked perfectly. 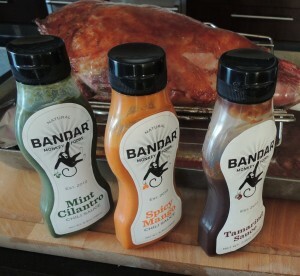 Yummy Bandar hot sauces with the roast lamb.